The Eppendorf Pipette Liquid Handling Starter packs with Research plus pipettes were designed to give you the ability to accurately pipette any volume from 0.5 μL to 50 mL between any type of vessel (tubes, plates, bottles, etc.). The Eppendorf pipette package includes 4 single channel Research plus pipettes for accurately pipetting volume ranges from 0.5 μL to 1 mL. Also included is the Easypet 3 motorized controller to simplify applications requiring large pipetting volumes from 1 to 50 mL with serological pipettes. The included Eppendorf Repeater M4 speeds up dispensing series with up to 100 dispenses from a single aspiration. 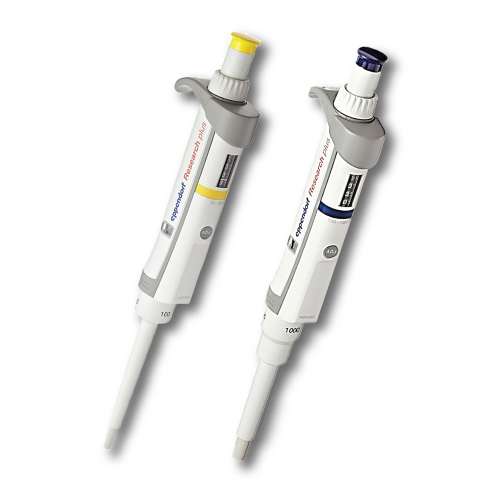 Complete your package and add Eppendorf epT.I.P.S. pipette tips to your order. Eppendorf pipette tips are designed to fit perfectly on our Eppendorf pipettes, ensuring a tight seal, improved accuracy and reproducibility, and better data.